This is a quite interesting postcard and after having spent a little time to research it a bit, a few details were found out that give us a better insight into The Sinclair Garage. Record has been been found of it as far back as 1911, when this postcard is dated “Papa and Me”, evidently by the little girl standing on the left side of the photo. It was found that it was at least in operation up until the 1920s and possibly later. The garage was recom-mended and listed, as seen in the 1918 Automobile Blue Book, just below on Middle St. in Portsmouth. The garage handled the Studebaker product line at the time and the road-ster and touring car seen just behind it in the photos on the left, are the small 20 h.p. Flander’s that the company offered. The roadster has a sign hanging from its running board, that is lettered “Flanders 20”. Just behind the two may possibly be an EMF, another well known car that Studebaker was involved in at the time. Can any of our readers tell us if this grand building has survived? The Old Motor photo. 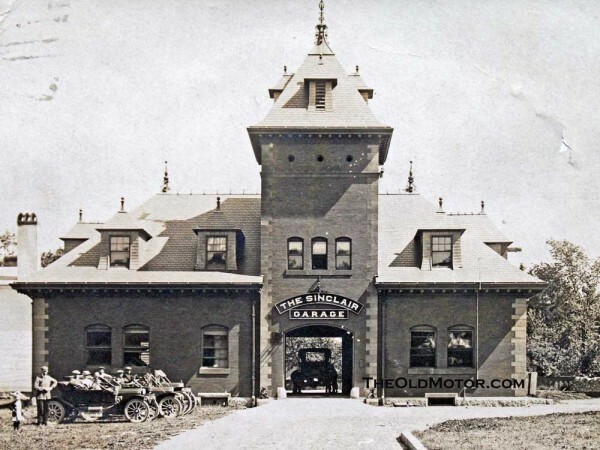 This entry was posted in Auto photos 1885 - 1920, Garages and Dealerships and tagged EMF, Flanders, Studebaker, The SInclair Garage Portsmouth NH. on google maps. Going north from where the pin landed, the building at the corner of middle and richards street sure looks like the correct roof configuration to be the old sinclair garage. Check it out! Koke, I bet if it is there your can find it from the street level feature….I just don’t have the time. That is quite a building for a garage. I suspect there is a back history and the garage was an adaptive re-use. Anybody have any information? The round portholes in the tower almost suggest it might have been an electric railway power house and station complex. Coogle street level for Middle St. and Richards St. does not match the Sinclair Garage and I can not find any buildings along Middle Street that do. I fear the structure may be lost. You’re pretty close. That’s the old Sinclair Inn. I can only assume the garage no longer exists and was located next to the inn, where the current 6-story building stands. 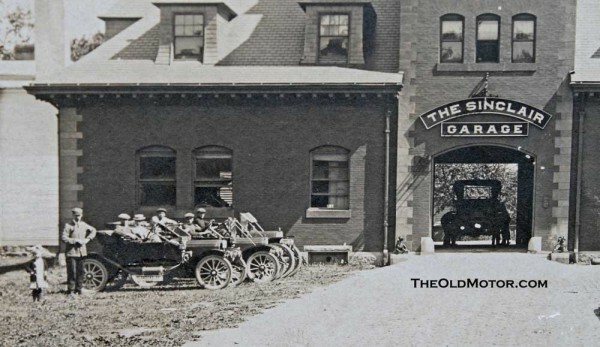 The story of this garage starts with an extremely wealthy industrialist and politician named Frank Jones, who owned one of the largest breweries in the country, the Frank Jones Brewery in Portsmouth, NH. He bought the house next door, known as the Jones-Sinclair House, as a wedding present for his daughter around 1890. The newlyweds, Mr. and Mrs. Charles A. Sinclair, extensively remodeled their new home. They *may* have opened it as the Sinclair Inn during their ownership. They also built the large brick stables next door around 1891. Another Portsmouth resident, Arthur W. Horton, owned the mansion and stables in 1911. By that time, they were definitely known as the Sinclair Inn and the Sinclair Garage. Sadly, Portsmouth demolished the garage in the early 1970s and replaced it with housing for elderly and disabled people, the Margeson Apartments. Ronald, Thank you for sharing with us the history of the building.